Skill gamers jargon is a unique area of gamerisms because the language is distinctive. Many terms in this section are not found elsewhere at the site. Of course, that does not mean that skill game players are any less passionate. On the contrary, when you consider the games of chess and backgammon for example, the description of passionate is applicable for these keen players. Additionally, chess and backgammon are classified as strategy games at gamerisms. Skill game terms for chess + checkers, backgammon, rummy, billiards and darts are defined here. Puzzle, Word, Tile & Dice Games plus Poker Card Games, a grouping of 12 other card games complete the 10 skill games categories at gamerisms. We begin skill gamers jargon with the definition of these game types. A game of skill is a game where the result is determined generally by mental and/or physical skill, as opposed to pure chance or luck. Skill games require additional equipment/tools to play=dice, a game board or playing cards. There are several types of skill games: card, board, tile, physical or sports, word, dice and puzzle games. A benefit of skill games is that they are a method of exploring one's own competence. These games encourage keen players to analyze and develop strategies. Below find a description for each skill game or group of games, examples of skill game jargon or terms and any additional features provided at gamerisms. 3 part chess glossary, 2 chess strategy articles: Chess Game Balance and Chess Attack Strategy plus checkers glossary, rules, history, jumping/capturing and tournament playing tips. Also Chess Quiz and Chess Facts-Trivia report. Examples from Chess Glossary: Chessboard, Connected Rooks, Counter Play, Cover, Crosscheck, Diagonal:and Discovered Attack. Examples from Checkers Glossary: Kings, Man or Piece, Pre-determined strategies,Two for One Strategy and Trap. 3 part backgammon glossary, Backgammon Quiz and Backgammon Facts-Trivia report. Examples from Backgammon Glossary: Cube Decision, Dance, Dice, Dilly Builder,End Game, Fast Board and Fly Shot:. The skill game of Rummy in 6 parts begins with an Introduction detailing rummy versions/variations followed by over 100 rummy terms in a comprehensive 3 part glossary. The other 3 parts include game rules and strategies for Gin Rummy & Oklahoma Gin, Canasta + 5 Online Poker Tips plus 7 Rummy Versions--More to Explore. Also Rummy Quiz and Rummy Facts-Trivia report. Gin: in Gin Rummy, the term gin literally means ten melded cards. Gin Hand: in Gin Rummy, a gin hand is identified as a hand that possesses no cards that are unmatched. Gin Rummy: skill game where the player attempts to make a series of sets/runs to eliminate any deadwood in his or her hand. Billiards at gamerisms provides a 2 part glossary plus Billiards Quiz and Billiards Facts-Trivia report. Peas or Pills: small plastic or wooden balls numbered 1 through 15/16. Darts offers a 2 part glossary plus Darts Quiz and Darts Facts-Trivia report. Easy In, Easy Out: refers to a dart game where a double in/out is not mandatory. Fat: term for the section of a number valued at a single score that is located between the double and triple rings. Flat Tire: occurs if a dart ends up in the black area surrounding the board, thus no score. Foot Fault: you just stepped over the throw line boundary while shooting. Game Shot: a shot that wins the game for a player. The Puzzle Games Glossary offers details of popular puzzle games. Some examples are Sudoku, Crossword Puzzles, Bejeweled, Deal or No Deal and, Chuggles. A glossary is provided along with a list of the 5 most popular puzzle games. The Word Games glossary in 2 parts offers a wide assortment of word games. Examples of word game types that are defined are pencil and classic followed by a glossary plus a list of the 5 most popular word games worldwide. gamerisms focuses on tile games here, specifically mahjong, dominoes and paigow. These 3 tile games have a common denominator in that all games boast passionate players worldwide and have been around for centuries. Poker Dice and Yahtzee followed by Boggle, Bunco, Farkel, Kismet, Stack and Shut the Box. Sic Bo and Craps complete the list of 10. Rules, scoring and playing tips are described for all these skill games in our exclusive glossary format. The article begins with wild card games, moves to jackpots, stud derivatives and lastly, odd and unique poker versions. Poker Stud variations of 5-card, 6-card and 8-card are detailed. Also, it is likely you recall more than a few of the classic card games of Deuces Wild, Woolworth, Baseball, Spit in the Ocean, Mexican Stud, Cincinnati, Knock Poker, Lowball, Bull Poker, 2-card Poker and Indian Poker. 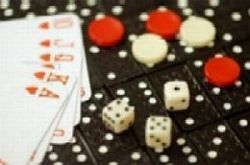 Skill Games Legal Disclaimer In most countries, skill games do not constitute gambling because they involve predominantly skill, as opposed to chance, and are designed as interactive online entertainment for adults. This page is the introduction to the distinctive world of skill gamers jargon. There are 10 skill game types to explore for passionate players.